Welcome to Thinking Out Loud Thursday! So glad you popped in. If you're a blogger, link up below and share what you're thinking out loud about today. 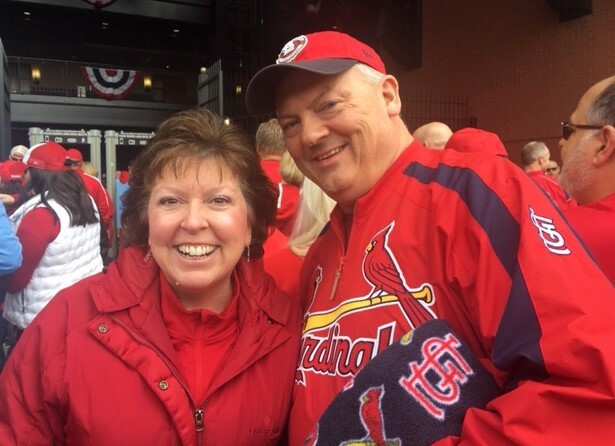 Last Friday, Eric and I had an opportunity to attend the home opener game for the St. Louis Cardinals. It was so much fun and I'm still thinking about it! 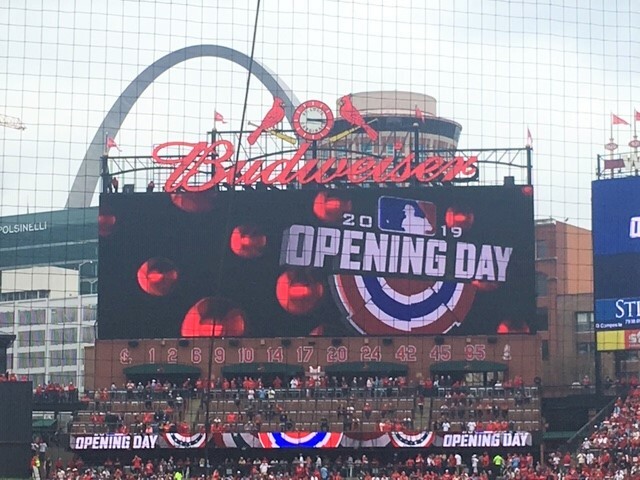 St. Louis treats the Cardinals home opener like a national holiday. I have to admit, we've been to several opening days and the excitement of getting to go never gets old. 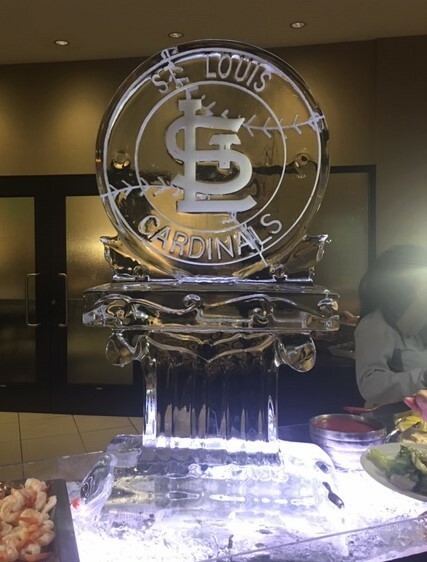 The Cardinal organization puts it all out there for the fans and you would have to be dead inside to not enjoy it. 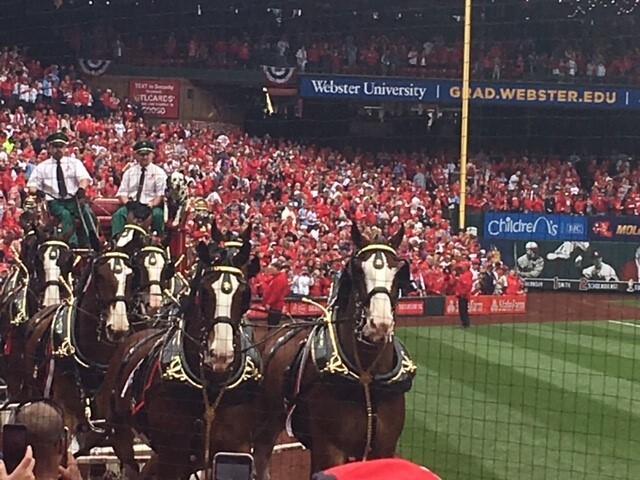 The pregame is kicked off as the Clydesdale horses parade around the track. Then the Cardinal Hall of Famers enter the stadium in convertibles, followed by all the current players. 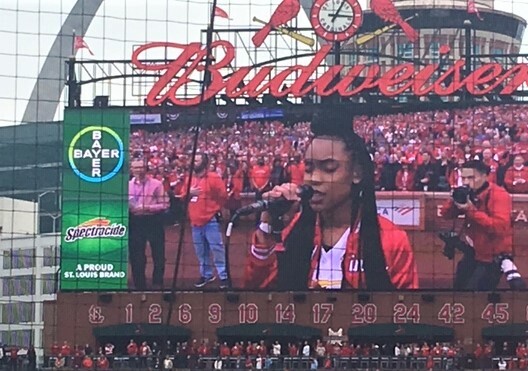 As an added bonus, this year the National Anthem was performed by local Kennedy Holmes and followed up with a military plane fly over. Literally brought tears to my eyes! Technically, the Cardinals lost the game last Friday. But just being in the park made us feel like winners! Now it's your turn - what are you thinking out loud about today? Link up and share! So very cool. What a great time. I will be sharing the A's Opening Night tomorrow. Thanks for hosting and I hope that you have a wonderful Thursday. Cardinals may have lost but it's only the beginning...blues won last night and it's close to the end! So glad i read this today, Penny! I found Natalie's wellness linkup too. I've read such wonderful posts and I'm not done yet! Baseball opening day is definitely holiday worthy. I don't know if they still do, but Topps used to produce a set of baseball cards depicting everyone who started games on opening day. I love that. Go Rockies! Baseball! You're right -- winning isn't important; just going to a game is what matters. I grew up a Mets fan so I'm used to losing! Sounds like you had a great time! I don't think I've ever been to a real baseball game... unless it was when I was a kid. Looks like a lot of fun. Thanks, Penny, for hosting and have a great weekend! Please feel free to join my Wellness Wednesday link-up on every second Wednesday of each month. Those are some darling baseball tennies you shared. PC would love for me to sport them to all his games. We just watched his beloved Reds beat the Cardinals tonight...which very rarely happens. Wishing St. Louis and Cincinnati a great season.